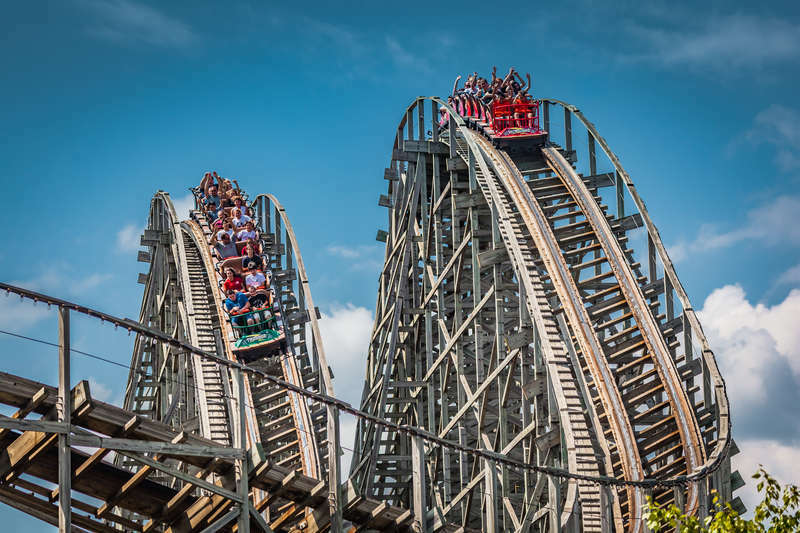 Located only a couple hours drive from downtown Philly, Hershey's a land packed with farms, antique shops, and many, many roller coasters. 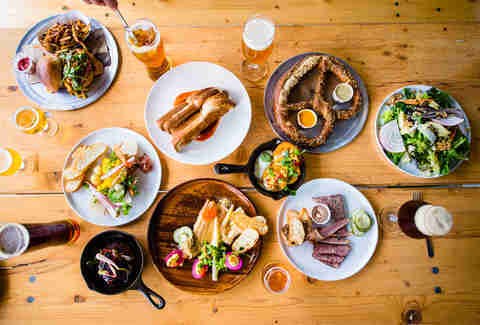 Yes, the town is best known for the chocolate brand that bears its name, but if you’re less into candy and more into fine dining, the restaurant scene here does not disappoint: Hershey is home to not only the HQ of Philadelphia’s favorite brewery, but a collection of worldly seafood and farm-to-table menu options. Here’s a look at some of the best things Hershey has to offer, whether you're looking for an outdoor adventure or an indoor feast. 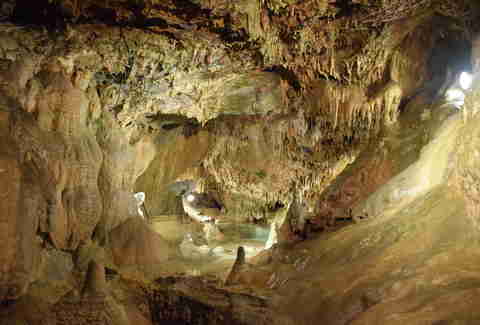 Hershey's home to Indian Echo Caverns, a winding show cave where you can take guided tours starting with the somewhat-spooky 70-plus-step decline into the cave (so save some energy for those 70-plus steps back up). When you’ve made it outside again you can poke through Gem Mill Junction to try and snag some amethyst or other stones, and there’s a free-range zoo on-site to awaken your inner child (or actual child). Old Annville is a historical small town with a Main Street that looks like something straight out of a vintage postcard. Millers settled in the area in the 1720s, and the locals have since tried to preserve the history of the town. Visit today and, besides taking in the grand, historic buildings, stop by the Allen Theatre, known for its indie and foreign flick choices, or check out the Suzanne H. Arnold Art Gallery at Lebanon Valley College for curated exhibits often featuring local artists. Any self-respecting bar in Philly is bound to have Tröegs on the beer menu, so a trip to Hershey should always include a visit to the headquarters of Tröegs itself. Stop by the tasting room for an extensive tap list and menu of farm-to-table food specials, including cheese and charcuterie boards that can be specially tailored to suit your beer of choice. You can also opt for either a self-guided tour or a more in-depth $5 guided tour of the vicinity, with (of course) a few free beer samples along the way. Though you may be tempted to spend the day shopping at the Tanger Outlets, try to opt for a more authentic local experience by perusing through the dozens of antique and vintage shops Hershey has to offer. A great place to start is the Crossroads Antique Mall, a massive farmhouse co-op building filled with vendors offering up pottery, furniture, and, being Hershey, lots of chocolate-related items. We all know Hershey as the hometown of the eponymous candy brand, so it’s no wonder the area’s long history of chocolate-making would infiltrate other parts of the food and drink culture there. This brings us to Cullari Vineyards and Winery and its boutique wines, most notably the best-selling Coco Nostra, a chocolate wine that pairs well with -- you guessed it -- more chocolate. While you’re on the winery kick, you should also stop by Cassel Vineyards where you can try the chocolate port dessert wine. If you’re going to visit Hershey, it’s best to embrace the region’s most notable export and take full advantage of all the chocolate and other assorted goodies easily at your disposal. 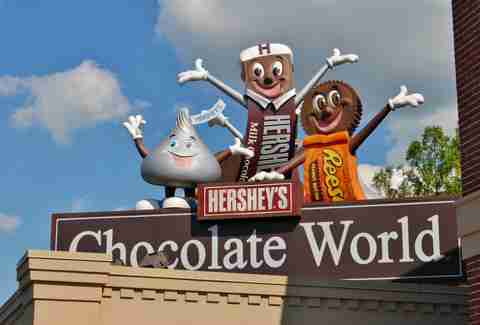 Pay a visit to Hershey’s Chocolate World where, besides being able to buy a ton of candy, you can also take an interactive tour detailing exactly how chocolate is made. Much like a wine-tasting, you can opt for a $11 chocolate tasting, or spring for a little more and enter the DIY candy world, where you’ll leave with a candy bar personally designed by you. If you choose to hang at Hotel Hershey, don’t forget to spend some time at the Iberian Lounge, where you can order off a lengthy list of bourbons, whiskeys, and global wines, as well as a menu of signature chocolate cocktails made from the area’s top products. Sink into one of the tufted leather sofas and enjoy jazz music by local and visiting musicians every night. You can also enjoy small bites like tiramisu -- just be mindful that the lounge doesn't take reservations. 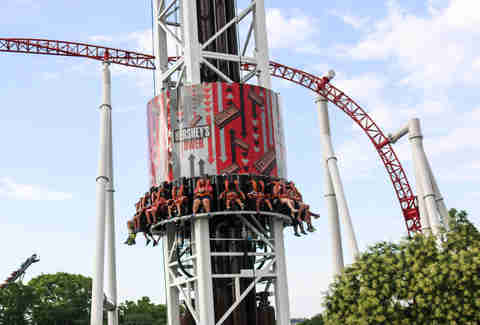 Anyone who grew up in the Philadelphia area probably took a field trip or two to Hersheypark, but the place can still be fun as an adult now that you’re actually tall enough to try all the rides. If roller coasters aren’t your thing, The Boardwalk at Hersheypark is full of water rides that suit any comfort level. To make a night of it, try one of the camping options at Hershey, where you can either bring your own tent or RV, or rent a cabin. 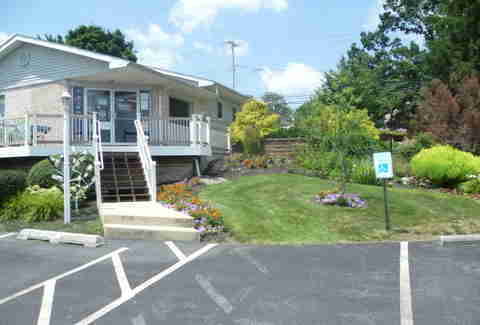 Traditional indoor lodging is also an option at the Hershey Lodge and Hotel Hershey. Like so many areas throughout Pennsylvania, outdoor activities are a must at Hershey, and your options aren’t solely limited to Hersheypark. Go outside and try your hand at kayaking (and Bald Eagle spotting) with Cocoa Kayak Rentals, or rent a 14-passenger Pontoon boat on Lake Frederick from Far From Workin River Adventures. For something besides water-based activities, look no further than the Horseshoe Riding Trail, where novices and experienced riders alike can rent horses for a few hours and explore central Pennsylvania. If you’re completely inexperienced rider, lessons are available as needed. Being in the midst of such vast farmland does a lot of favors for the culinary experts of Hershey, Pennsylvania. For one of the best dinners in Hershey, try The Mill, housed in what was once the Curry Feed Mill and serving dishes sourced from farms throughout Hershey and other regions of Pennsylvania. Every Tuesday there’s live music and drink specials, but stop in any other time for black pearl salmon or diver sea scallops. For an even more refined surf-and-turf menu, Devon Seafood & Steak offers daily fresh oysters, fish specials, chilled shellfish, and even a few takes on traditional sushi rolls that can be ordered alongside perfectly prepared steak cuts. Who needs chocolate when you've got all that goodness? Marielle Mondon is a writer from Philadelphia. Follower her on Instagram and Twitter @MarielleMondon.